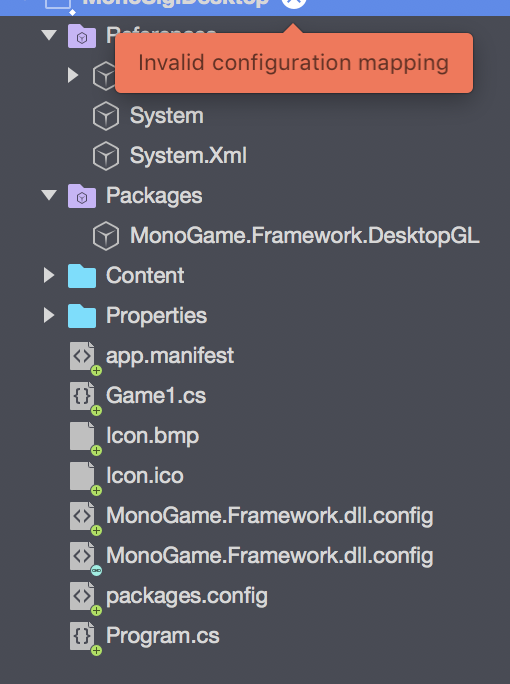 Hey I'm running visual studio for mac, kinda new to the mac environment, I have installed mono develop, and monogame, yet I don't see the template for monogame in visual studio. I have enabled the alpha channel and it does not appear. Any assistance would be grand! Have you solve your problem ? the add-in used to be there for me but now its gone for now just use monodevelop/xamarin studio to code with monogame until the add-in is back and fully functional. you can use monodevelop for monogame on mac. there you still have the correct add-in that is fully functional. Same here. Android and MacOS platform are not checkable. I clicked the Refresh button after selecting the Alpha channel and the MonoGame addin appeared. If you don't see the Alpha channel, select Manage Repositories in the drop-down menu and then make sure it's checked. Once it's installed, in the template chooser for a new project, you'll see MonoGame under Other -> Miscellaneous. 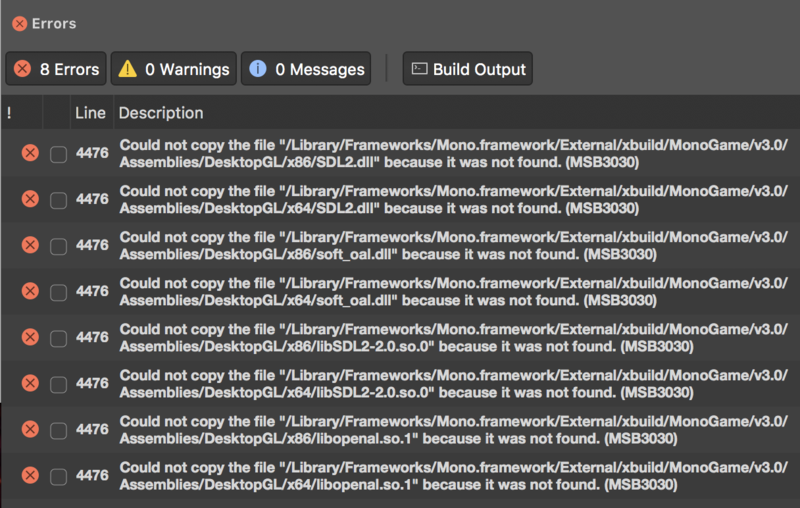 "Could not get information from repository: http://addins.monodevelop.com/Alpha/Mac/7.3.3/main.mrep." Exception occurred: The remote server returned an error: (404) Not Found. System.Net.WebException: The remote server returned an error: (404) Not Found. OK, I reinstalled Visual Studio for Mac a couple of times and the last time I tried to enable the Monogame extension again. I received the same message as above but this time a progress window flashed briefly as if something was loaded. Checked extensions and Monogame was there and I was able to add it. Don't know what changed or how it worked but it does now. Go figure. Thanks to gee4vee i have now the template, but the MacOS is not checkable, also the iOS version doesn't run, it says is linking to the simulator but nothing happened. Any idea? Have you installed Xcode IDE? 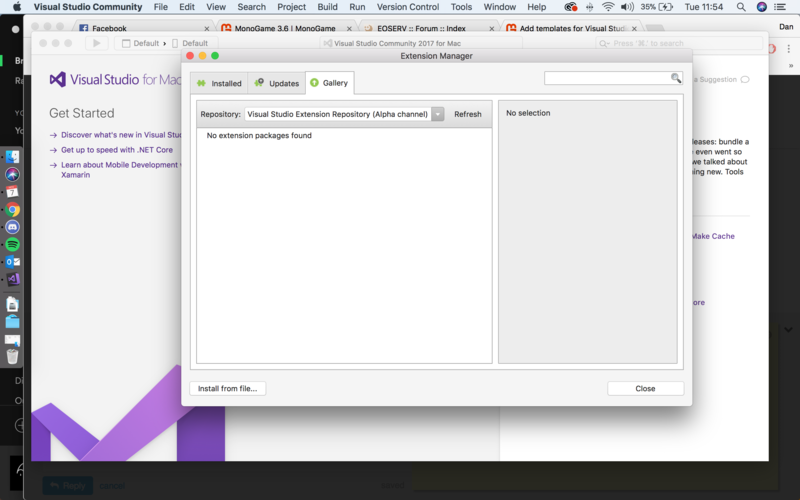 because visual studio for mac uses the simulator from Xcode to run. A new Template Adding for Visual Studio for Mac is up in the beta channel its called MonoGame Extension . Code should be merged into the Repo in a few days and will be included in the Mac Installer. Hi @dellis1972, I found that the cross-platform OpenGL project generated by the new extension report an error on VS for Mac, it says Invalid Configuration Mapping. Also there's error while building because MonoGame did not install multi-architectures targeted dependencies, I remove the x64 and x86 directories and all .dylib files from the project and refer MonoGame.Framework.DesktopGL from nuget instead of the local framework installation, it works well. Thanks for your reply, @cra0zy. 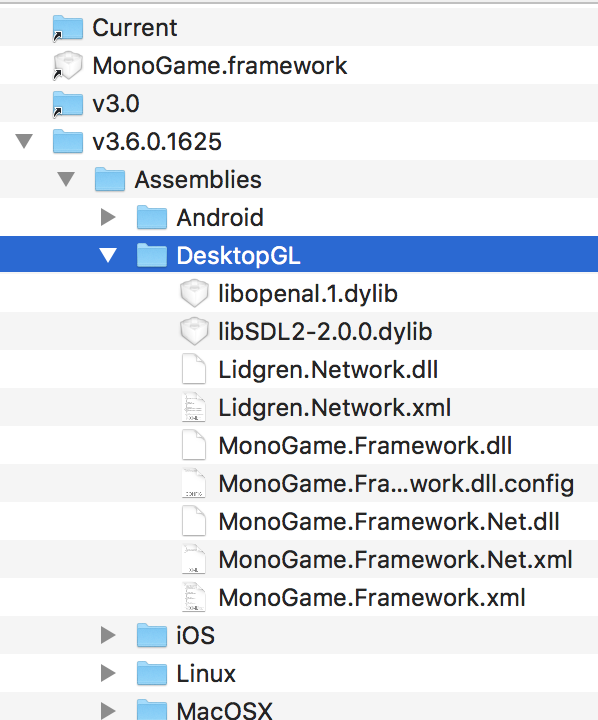 I've already install the MonoGame SDK from the downloads page. I installed the version 3.6, as the picture shown in my latest reply. It seems that the directory structure of the SDK has been changed. Yep, it's solved after I restart the IDE and re-create the project. You need the *development version, I should have been more precise. Thx, problem solved after installed the development version. I have just followed the instruction(s) on this thread to get the Mac version of monogame working. There is an issue that seems to be with the file paths which is stopping visual studio from running the application. It runs in the xamarin profiler and shows a blue background so I'm calling that a win! Open visual studio - you will not have the template! Visual Studio community -> extensions -> find the alpha repository -> click toggle box! Should be golden from there! Hopefully someone will find that helpful!